from "Agriculture, An Alchemical Treatise"
glass, seeds, books, soil, other objects. 8ft.x3ft.x20ft. Spiritual practice often requires reconciling belief with action. We distinguish between belonging to a particular spiritual community and being a practicing member - "I am a Jew" does not always mean one practices Judaism. Identity, belief, and action are often in precarious balance. "Practice what you preach" is a familiar dictum precisely because beliefs do not always give rise to right actions. But when they do, the connection is as natural as breathing. To breathe in means to breathe out. 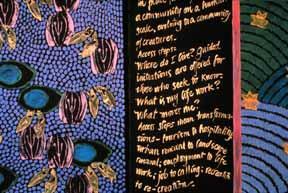 What artists feel deeply must "come out" in their artworks and communities. Good art is art of consequence, and those who make art of conscience and consequence are engaged in activism - which can be a form of spiritual practice. Alice Dubiel is a Seattle-based artist who is passionately concerned about land-use issues. Her mixed media altars and shrines both honor the earth and query how we might create a sustainable agriculture without causing environmental damage. Citing scholars like Evelyn Fox Keller, who writes about "what was lost and what was gained after science abandoned the perspective of alchemy," Dubiel advocates a more holistic approach that can bring nature and culture into balance. In the mixed media installation SPECULATIONS: Urban Sustenance (figs. 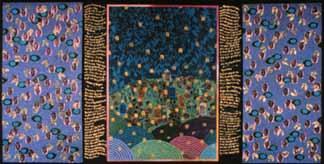 42 & 43), Dubiel constructs a stepped shrine on which bowls of seeds and flats of soil are arranged below a triptych of hanging scrolls. The central image is of a livable city, replete with stars (representing fertility) falling into the ground. Dubiel invites viewers to write their "wishes and commitments" for a "sustainable community" on black tissue, and "plant" them with vetch seeds in the flats. She gives viewers seed packets to take home and plant in their own communities, and at the close of an exhibition, she transplants the seed flats to a community park. In this way, the artwork becomes part of the life cycle it honors. The rhythmic planting and sowing exist as both metaphor and reality, and the shrine becomes a living example of sustainable agriculture at work. Dubiel's ability to enlist a community of dedicated participants is crucial to the success of her project. Her SPECULATIONS scroll speaks of initiating a broad, evolving community that begins locally and extends globally. What sustains such a community? Dubiel implies that community begins at home, with individuals like us. She seems to say that only we can transform "tourism to hospitality; urban renewal to landscape renewal; employment to life work; job to calling; recreation to re-creation [. . .]." To do so, we each must grow and then guide one another. In effect, we can all contribute because our cultural traditions connect us with each other and with the natural world (see Whispers in the Dark: Sharing our Light, a multi-ethnic celebratory shrine, in Gallery V). For Dubiel, community ultimately extends through space and time. She links the teachings of a 12th-century proto-feminist saint, Hildegard von Bingen, to those of an environmental action organization, the Frisco Bay Mussels Group. In SPECULATIONS, for example, she quotes Saint Hildegard: "The earth sweats germinating power from its very pores . . . the soul is the freshness of the flesh, for the body grows and thrives through it just as the earth becomes fruitful through moisture [. . .]." She then quotes the Frisco Bay Mussels Group: "People who want to maintain a full life for themselves and for the watershed are shaping human celebrations which respond to that resonance." Although the "watershed" referenced here is the local bay, the "resonance" encompasses much more. Dubiel links her environmental conscience to her western heritage. She says, "I believe that my intellectual and artistic life tends to investigate land-use issues because I am a westerner in every sense: I was born here and I inherited its mythologies." But what she calls "the legacy of Jeffersonian dreams of small farms spreading through the continent" has, in her view, contributed to "mismanagement of land for what are called agricultural purposes." To reorient and reconstruct those "dreams" so they become "sustainable" requires a broader view of connection. As Dubiel states in Washington Water Tale: Culture Unifies the Elements (1990): "connectedness, then, can become a metaphor for the way we participate in our environment. Harm to others, including rivers and trees, means harm to ourselves." Kim Abeles is a Los Angeles artist who also recognizes the importance of "connectedness," but from a different, and often ironic, conceptual stance. Born in Richmond Heights, Missouri, in 1952, "during a time when industry was thought to save the world and make it crystal clean like a new, enamel kitchen," she spent most of her childhood in Pittsburgh, then a Pennsylvania steel town. She moved to "smoggy Los Angeles" in 1978. Abeles's art has consistently interrogated environmental and other community issues (such as labor, aging, and HIV/AIDS) in the context of the urban west. She says, "My work from the past two decades results from the urban experience, the contemporary viewpoint of our historical follies and a Sisyphean journey in search of Nature." If looking for "Nature" in L.A. seems dubious today, one need only recall the city's symbolic legacy. Known as the "City of Angels," Los Angeles was thought to be an Edenic paradise, a garden in the desert, and a developer's dream become reality once an aqueduct carrying water from the Owens Valley 250 miles away was built (in 1913). In 1950 Lee Shippey wrote, "It took the aid of President Theodore Roosevelt, an Act of Congress, the purchase of vast areas of land and a small civil war in which guns and dynamite were used, but the swaggering, boastful, irrepressible city met every challenge and won every battle." He prefaced those salutory remarks with "Los Angeles is so daft on progress it once tore down its City Hall to create a parking lot." I have this romance with Los Angeles. I wear the stillness of its empty nightgown. If Legend is a poetic homage to Los Angeles architecture and the "human-touched moments" it embodies, it is also a critique. Abeles's art acknowledges "all the components" - both the "problems" and the "achievements" - of the "wiggling" metropolis. Despite the city's rhetoric (what Michael Sorkin calls "the fictive scrim" of its "mythologizers"), Abeles can wear the "empty nightgown" and give it a meaningful shape. 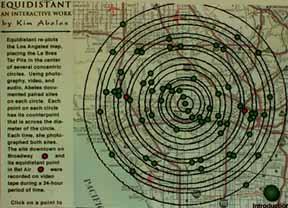 Both Legend for a Mapping (1997) and EQUIDISTANT (1996) "map" Abeles's complex relationship with Los Angeles. Launched first on the Internet and then on CD-ROM, EQUIDISTANT uses concentric mapping, photography, and audio to link "sister sites" - locations that share a singular distance from a constant center - the La Brea Tar Pits. Abeles says she "envisioned concentric circles drawn upon the Los Angeles city map with the La Brea Tar Pits as the center point. (The Tar Pits as a beginning, a center of time and space, a place where the elephants sink and the surface bubbles.)" For Abeles, the sites became "psychic pairs." Some were selected "for their fame and importance," while others came into her purview as if she were "traveling by air like a housefly waiting to land." Logic and divination dictated her choices; the system dictated an equivalence - it belied conventional economic and class-based distinctions. She writes, "Indeed, the keen eye sees beauty even in decay, and spiritual decay may sparkle [. . .] I know where beauty is and you can buy it as a necklace in Beverly Hills. I know the beauty of rust against wood against crumbling paint [. . .]." All of the more than 120 sites selected for EQUIDISTANT pivot around the La Brea Tar Pits, Abeles' self-declared metaphor for Nature: "Nature offered the balance for my observations, since she consistently insists on pushing wildly through each sidewalk, park and cemetery." The Tar Pits are also a kind of cemetery, where skeletons more than 50,000 years old have been preserved in black tar. And although Abeles speaks of Nature "pushing wildly," she also writes that "In Los Angeles, Nature can be found groomed, polished, and shaped into friendly shrubs." This bi-polar tension is what gives EQUIDISTANT its shape. Abeles's earlier and more didactic artworks create equilibrium by other means. They urge viewers to put their world back in balance through political action. 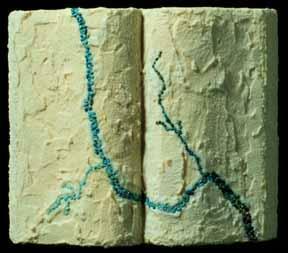 Since 1985, much of Abeles's art has focused on environmental issues, particularly water and air pollution. Her Smog Collectors series includes sculptures made from recycled automobile exhaust systems, as well as stenciled images on plexiglass and porcelain. Abeles invented a method of creating these images from smog. First, she cut stencils in order to selectively "expose" a surface to air. As the particulate matter from the smog accumulated over time, an image "developed" on the exposed surface or plate. Thus, the invisible became visible. In one sense, the polluted air authors its own image; in another, the signature belongs to the person depicted. 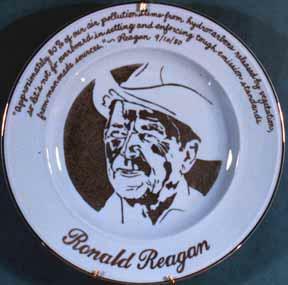 Of all the commemorative presidential portraits, Ronald Reagan's is especially dark. Abeles left his plate on her studio rooftop for 40 days, as testament to the damaging effects of his (and Secretary James Watts's) anti-environmental policies. Abeles's Smog Collectors has educated viewers about smog's adverse effects. In 1991, the California Bureau of Automotive Repair and Department of Consumer Affairs sponsored her on-site sculptures to inform citizens about the state's Smog Check Program. In 1992 Abeles co-curated "Smog: A Matter of Life and Breath," in collaboration with the California Museum of Photography. The exhibition brought scientists from the Statewide Air Pollution Research Laboratory together with artists to increase public awareness and advocate for improved air quality. Funded by the Santa Monica Bay Restoration Project. Abeles's Run-off Dolphin Suitcase directly promotes social action. She carries the suitcase (bearing her message) into schools to teach children that throwing trash into storm drains has consequences. The dolphin suitcase is a sculpture made from run-off debris - trash that washes up on beaches when storms cause drains to overflow. Both the case and its contents are constructed from this trash - items like drinking straws, motor oil containers, and styrofoam - which are polluting California beaches. Run-off contains spilled oil, traces of rubber, asbestos, lead, herbicides, and pesticides which pose a serious health threat to marine life. Scientists have already documented numerous pollution-related diseases among the Southern California dolphin population (see full description with caption for illustration in Gallery V). Since Run-off Dolphin Suitcase was initially funded in 1995, Abeles has continued to tour schools and teach children an ethic of responsible care. In 1996 she produced a bilingual environmental workbook called the Environmental Activity Book, which has been distributed in Los Angeles schools. Funded by a grant from the City of Los Angeles Cultural Affairs Department, the workbook uses pictures and writing exercises to get children involved in creating a cleaner, more livable world. 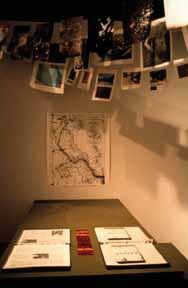 Installation with maps, photographs, information and log book. Basia Irland is a New Mexican artist whose work also teaches responsibility and care. Like Abeles, Irland's practice involves "mapping" one's relationship to the environment. Since 1995 she has been facilitating A Gathering of Waters, a bi-national grassroots and community-based artwork in which water is hand-carried along the entire 1,875 mile length of the Rio Grande/Rio Bravo River. This ritual act symbolically restores the river by literally bringing its water to the sea. Irland believes that rivers like the Rio Grande/Rio Bravo have been seriously compromised by over-consumption and invasive controls (such as dams and other "improvements") that have been instituted. A Gathering of Waters was initiated on La Dia del Rio, October 21, 1995 at the source of the Rio Grande near Alamosa in Southern Colorado. Using a special canteen-like vessel, water was passed "from school children to teachers, from farm workers to politicians, from citizen to citizen, and from community to community." The 150 mile passage along the Pueblos, from Taos to Isleta, took Native runners two days to traverse. Irland adds that even the Governor of New Mexico and the Mayor of Albuquerque ran with the Native Americans. The vessel was carried through New Mexico, and then on to Texas, Mexico, and the Gulf of Mexico, the river's final destination. Since then, A Gathering of Waters has been displayed at various sites along the river. Irland constructed a portable interactive exhibition which enables viewers to read and contribute project documentation. Maps, photographs, articles (in notebooks), and a historical logbook invite viewers to read and write while seated at a handmade table. The table's surface has been incised with a map of the river. Photographic images printed on cloth are suspended above the table like Tibetan prayer flags. Irland hopes that her project will celebrate the diversity of life along the river, and help people form partnerships that will create a healthier future. fig. 48: Wilderness Series, "Rio Grande Atlas"
Wood, sea salt, turquoise, 12"x14"
Irland's art has explored water and wilderness issues for more than 30 years. 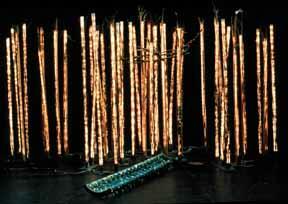 Her work is interdisciplinary and takes many forms, including performance, sculpture, photography, and poetry. Sometimes the conventional "art object" almost disappears, while at other times it carries the burden of meaning. In her Wilderness Series, Irland carves wooden "books" and covers them with earth, salt, bones, or stones - natural elements that seem relevant to the site. "Rio Grande Atlas" uses turquoise to chart the river, while Echo Canyon's "text" is comprised of sage and cedar (see Gallery V). Irland says such objects speak "an international ecological language" that all can understand. Her poetics also make specific historical references (salt, for example, has been an instrument of exchange and a constituent in politically-related events like Gandhi's salt march). 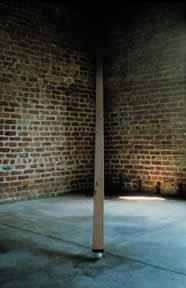 However, much of Irland's work is metaphorical and contemplative. In Sanctuary she "collaborates" with nature to create a serene, meditative space. Light tubes are wrapped with water plants, reminding us that humans can interact with nature to create beauty, harmony, and light. "Art should be simple like making tea or spitting on the ground. Would you care for some tea?" asks Su-Chen Hung in a 1993 interview for West, the journal of the San Francisco Art Institute. With those words, the politesse of "tea" is nuanced by the politics of "spit," and Hung introduces herself, her art, and a host of dualities. "Chinese green tea OK?" The interviewer answers, "Of course." Su-Chen Hung was born in Taiwan and has lived in San Francisco since the mid 1970s. She studied photography and filmmaking at the San Francisco Art Institute, and sociology at Tunghai University in Taiwan. She retains dual citizenship and explores the meanings of bi-culturalism in her work. However, neither her identity, her spirituality nor her politics are worn on her sleeve. For example, when asked whether her viewpoint derives from Zen Buddhism, she commented on a multitude of influences, from Buddhism to the Bible. She then said, "All religion boils down to the fact that everything is within [. . .]. Even though we know that, it still takes so much time to realize this simple thing, that everything is within ourselves. To say so is easy, to perform it in daily life takes practice." Sitting Green is based on Hung's daily practice of contemplation. 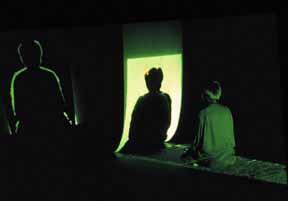 During the 30-minute performance, Hung sits in the lotus position while a green light casts her shadow on a screen. The screen is lit on both sides with burning incense; it burns with two slow flames, rising along the contours of Hung's shadow where she has traced it with saltpeter. Eventually the flames meet, the screen falls, and the green light projects Hung's shadow on the far wall. Everything is revealed, and nothing is revealed. As Hung says, "everything is within ourselves." Sitting Green marked Hung's 1985 U.S. arts debut. Since then, she has completed over three dozen installations in museums, galleries, and public spaces. She continues to work with the most basic elements: light, space, time, air, water, and fire. She also resists committing to a single medium or theme, which critic Carol Lutfy says has "cost her" recognition by the mainstream American art market, this despite having received a $500,000 public commission for her work in the San Francisco International Airport. Lutfy believes Hung's work has "fallen through the cracks." She attributes this to Hung's "total absence of a marketing strategy": "Hung has not played the Asian card in promoting her work (although many critics and curators have played it for her [. . .])." This stunning comment is well intentioned - Lutfy's audience is international, comprised mainly of collectors (see Atelier No. 833, Jan./Feb. 1997). Even so, it raises perplexing questions: how important is promoting one's work; what determines an artist's success; and what role does identity politics play in today's market-driven art world? Su-Chen Hung makes art that directly addresses Asian American and immigrant identities, but not in ways that serve the art market. In 1984 she created East/West, a videotape based on her U.S. citizenship interview. The tape shows a mouth split in half, speaking Chinese on one side and English on the other (see Hung's biography). In 1993 she produced Silent Voice, a public installation sited in San Francisco's business district. Photographs of Bay Area immigrants dressed in black T-shirts were displayed in brightly lit kiosks. "I have something to say" (and similar statements) were printed on the shirts in bold white letters in the immigrant's native language (see Hung's bibliography). Both East/West and Silent Voice are about failed communication - the frustration of not being heard. Someone is talking but no one is listening. The words are palpable, but the speaker can not cross the cultural divide. Hung says that "language, class, race and color" are "invisible barriers." In these pieces, the titles suggest obstacles and oppositions, but not the degree of difficulty required to surmount them. Hung does say that "desire" can make a difference. And why else make art, especially art that refuses to play by the rules? Baby Green and Egg Works share concern for the natural environment, but are also about achieving balance when the personal stakes are high. In Baby Green, a redwood's cut limb hangs suspended over seedlings in a petri dish. In Egg Works, the weight of a pre-fabricated board rests on a small white egg, threatening to crush it. In both cases, the promise of new life is placed in great jeopardy - birth, growth, life, and death depend upon human volition, not chance. Hung plans to fill an entire gallery with "baby greens," so that "visitors will move through a dead, silent forest hanging inches above a struggling forest of tomorrow." She says, "As deforestation rapidly lays waste to our precious global resources, this installation is intended to transform a political concept into an immediate and threatening experience." Likewise, she wants Eggworks "to speak to the fragility, strength, balance, and risk in everyday life." There is no dichotomy between personal responsibility and social responsibility - these supposed "opposites" collapse into each other. The inner and outer conjoin; "everything is within ourselves." Hung once said that when she left Taiwan, she saw America "as an ocean waiting to be plunged into." 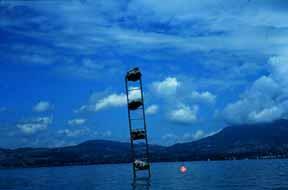 Although Reincarnation , a collaborative piece developed with Jim Campbell, was installed on a Swiss lake, the four large rocks perched on a partially submerged steel ladder convey a similar impression. During the daytime, viewers can ponder whether the rocks are ascending or descending, but once night falls, an audio track is activated. It plays and replays the sound of a large rock falling into the water. After each splash, a minute elapses before the rock falls again. There is something comforting about the rhythmic cadence of rock returning to water, even though awareness of its inevitability may cause some apprehension. The piece is cyclical; its rhythms are circadian. Earth meets water as if returning home. For Su-Chen Hung, the journey is never-ending. 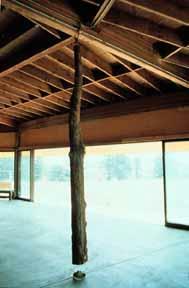 In 1994, one year prior to making Reincarnation, Hung created a video installation entitled On the Way Home (see Gallery V). It also integrates natural elements (earth and water), and uses technology (video and a train ride) to make the journey home. Hung says that her concept of home has changed over the years: "I never felt I belonged in Taiwan, and I eventually went back to find out why. And now, even though I have found the place where I do belong, I realize I'll always consider Taiwan my home because it's where I began. It's who I am. Ultimately, home is anywhere I go now, because I take all of this with me." Su-Chen Hung's work is about continuity and connection. East does meet West; spirit and action interlock; the inner and outer embrace. Does her work reflect her Asian heritage? One could just as well ask whether being a woman is relevant to her or any artist's work. She says, "I don't usually think about what's Asian in my work. Maybe when I was a student I addressed this more in a deliberate way. But now making art has become as natural and unconscious as taking a breath." All text (except quotations) © Susan Ressler.